There has been a great deal of controversy in recent years concerning the woman Junia mentioned in many translations of Romans 16:7, and described, along with the man Andronicus, as “outstanding among the apostles” (NIV). This has apparently stemmed from the reluctance of some to accept that a woman could be called an apostle. As a result some have argued that the name is in fact not the common female Junia but the otherwise unknown male Junias, whereas others have argued that the description should be understood as “well known to the apostles”. Suzanne McCarthy has reported on this issue several times, most recently in a post The Junia Evidence: X transgendered again. Scot McKnight has written a whole e-book on the subject, Junia Is Not Alone , which I have not read. Both the SMc’s seem to conclude that the evidence strongly supports Junia being both a woman and an apostle. What is the consensus? Andronicus and Junia were an outstanding missionary couple who no doubt planted churches. Arguably they were apostles both because they witnessed the risen Christ and because they were sent. As a complementarian pastor I have absolutely zero problem with this. If anyone was ever to write a history of church planting in Sweden in the 21st century, I hope they’d write about Phil and Emma Whittall and not just me – we’re in this together, it is a joint venture all the way and yet our roles are different. For more on how this works out read this. I am glad to read this from a Newfrontiers leader, and I have no real quarrel with it. It is fine that Phil and Emma have different roles, within their partnership and within any wider team they are in, as long as they have both freely agreed on those roles. But I would hope that they have chosen them not according to some dogmatic human position about which roles are for men and which for women, but on the basis of the different gifts and different callings which they have received from God. Sadly, I don’t think that is what the Whittalls feel able to do, as Phil’s final link is to an article by Andrew Wilson, on an apparently official Newfrontiers site, which prejudges the whole issue by starting with The Presumption of Complementarianism. Well, at least he makes it explicit that Newfrontiers approaches Scripture with this presumption, which of course makes it no surprise that that is what they find there. I won’t attempt here to answer Wilson’s arguments in detail, but I note that his appeal to 1 Timothy 2:12 completely contradicts his claim to “passionately support and encourage women in ministry, prophesying, deaconing, worship leading, preaching, teaching, leadership, missionary work, church planting and so on … but I still believe that only men should be elders” (a point which he promised, in a comment “25/01/2012 at 15:57” to address “in next Wednesday’s post” i.e. on 1st February). I can understand why Phil Whittall sees the need to defer to this official Newfrontiers teaching. After all, they are very likely sponsoring his and his wife’s church planting work in Sweden. But I wish he had left out of his post that final sentence with its link to Wilson’s post. This entry was posted in Gender and Leadership by Peter Kirk. Bookmark the permalink. Is there any possibilty that this verse may mean that Andronicus and Junias were well known among the Apostles rather than actually being Apostles? I believe that John Stott admiitted of this interpretation. I always see these things with a smile. My wife has a clear, demonstrated call as a pastor, possibly an apostle. I do not. I’m head of our house, she’s head of our church. No problems. God has blessed the relationship for 36 years now. I knew she had a call on her life from Jesus before we got married. 2. Think that the translation of the name settles everything in that regard or even tells us something relevant today. The meaning might indeed be “known to the Apostles” but it also may mean “known as an apostle”, though there is no basis to make Junia an apostle en par with Barnabas, let alone the Twelve. Iconoclast, some people, including the NET Bible editors, have tried to argue for this interpretation – but not John Stott, as Sue (thank you!) and Phil Whittall have both demonstrated. Sue has also shown clearly the errors in the argument for it in this post, this one and the rest of her series on Junia. David, thanks for that clear testimony. I know many women clearly called to Christian ministry, not always together with their husband. Thank you, str. The form Junias goes back long before 1927, to Luther and earlier, but it was only in 1927 that it was read back into the Greek New Testament. See my previous comment about the interpretation that Junia was known to the apostles. I have looked up my copy of the ESV. I see it is translated “well known to the apostles”, with the form Junias in the footnotes. The KJV/NKJV use the “of note among” style suggested by Iconoclast, which in our current age could be said to leave the question of women as apostles open rather than explicitly confirmed or denied. And all 3 translations are claimed to lean towards formal rather than dynamic equivalence. Has the ESV, or alternatively the KJV/NKJV, slipped into the latter mode here; if the ESV, to underpin its theological understanding? And as to how it works out for the Heaths, Cathy and I overlap in some areas of ministry, and have different emphases in others. And as a Reader, I happen to hold the Bishop’s licence. But that is the outworking of our giftings, not our gender. Apart from reading her argument being soured by her insistence on a conspiracy (when it just people sticking to their views, right or wrong), I cannot agree with that she has shown the errors of the argument, let alone clearly. At best she has refuted a specific argument in this regard (though her contradiction regarding Lucianus seem more like wishful thinking) – what she has not refuted is the possibility that the passage could be understood this way or that way. Well, Colin, a literal translation would be something like “outstanding/well-known in the apostles”. But this “in” often means “among” in the sense that the person referred to is one of the apostles. It doesn’t usually mean “to” or “by”. Arguments have been made that it can do so when used with this particular adjective, but (in answer to str) Sue has clearly shown that these arguments are based on misunderstandings of the Greek. I know Sue has elsewhere dealt with the issue of what apostleship means in this context, but it is not part of her recent series at BLT. Browse through her older posts on this subject at Better Bibles Blog. I think that I have rather defended others who say it is a conspiracy. Let’s see. First, “prominent among” is the most literal translation and the 19th century Vamva Greek revision of the NT says unambiguously metaxu “among.” The unbroken testimony of the Greek Orthodox Church is that she was an apostle. The article which hypothesized “well-known to” had one particular error in it that means the article ought to be revised. This is not a conspiracy but an error. My interest is in the particular Greek grammatical argument. I don’t want to mix the entire complementarian-egal discussion up in this verse. I don’t think anyone wants to. I can answer other questions if you are interested. Thank you, Sue. My main purpose in posting this was to separate this exegetical issue from the wider complementarian-egalitarian debate. Are you suggesting that the Lucianus citation about harmonides the pipe player is questionable? Surely a pipe player is one of the Hoi Polloi? I can’t see it otherwise. Not wishful thinking there. Maybe there is another Lucianus citation. I forget. I don’t aim to be conclusive. I just like reading the references, and when I find that they have not been cited properly, then I want to see the work revized along with the translations that mistakenly depend on faulty exegesis. Just saw your answer, Peter. And yes, I am happy that this couple recognize the most probably exegesis, and then take the argument from there. No problem. Not sure what you were refering to with Lucianus. Thanks. From what I have read of John Stott I get the impression that he thought that Junias ‘being of note among the apostles’ but not an apostle was one interpretation that could be admitted although he was not dogmatic about it. He certainly thought she was a woman. I think it is indisputable that women were in ministry and had active roles in the early church however, I think it unwise to conclusively assert that there were women apostles based on a single verse of scripture. What I would be interested to know is if there are any extra-biblical sources that affirm the existence of women apostles particularly among the writings of the early church fathers or their contemporaries. I don’t think that we can conclude anything from Stott, although I respect him. As someone has already remarked, I don’t draw final conclusions from this verse. Certainly the Greek Orthodox church honours her as a woman apostle, wife of Andronicus. However, Saint Nina was a 4th century ‘equal to the apostles’ and she baptized an emperor, and healed many people, preached and planted a national church. At least that is what she is recognized for. this is exactly the Lucianus item I referred to as I was speaking about the arguments you contradicted/refuted. A pipe player might be part of the masses but if he seeking fame, he is seeking to be famous to these masses, famous as a piper. Sure that also makes famous among the masses, will stand out among them. But he does so by being known to them. In this case, the exclusive and the inclusive interpretation are not mutually exclusive. I called your contradiction wishful thinking because you use the fact that the inclusive also applies to jump a complete denial of the exclusive interpretation. I also don’t see, to take one of your postings here, how a modern Greek rendition of Scripture or the opinion of the Greek Orthodox Church (which I suspect would not agree with your characterisation) is supposed to be relevant. Are they to have a special insight into 1st century Christianity just because they happen to speak a related language. There is absolutely no basis for calling Junia an Apostle in the way the term is commonly understood (in the 1st century, when these books were written, terms were still very much in flux – only Luke identifies the Apostles and the Twelve) – and the word itself only means emissary. And an Isapostolos BTW – despite the term – does not equal an Apostle but someone who is honoured like an apostle without being one. No, there are not. The first comparable case would be the Montanists, a 2nd century charismatic, chiliastic heresy. Its leadership consisted of Montanus and two women. However, given the nature of the sect, these acted as prophetesses and the existence of such has never been a problem, at least not genderwise. there is no such thing, if there is an ambiguity in the original language that cannot be transported into a similar ambiguity in the language of translation. A translator then can either translate things literally, which makes for bad English but avoids giving either of two possible meanings prominence (see Peter’s suggestion), or he can chose the meaning that he thinks is most probable. And there, opinion will often vary. A pipe player is a very humble musician. A pipe player is always a member of the masses. This could never be changed. It was very difficult to change classes in those days. if you want to discuss upward mobility in Greek and Roman society, playing the pipe would not be under discussion. Saint Nina had authority to baptize an emperor – that’s all – nothing more. The testimony of the Greek church and translations are related to translation issues not to the woman issue. The unbroken tradition of 20 centuries is a linguistic argument. We are talking at cross purposes. I am interested in the integrity of translations as my primary discussion point. If you want to just argue about women I may not comply. About Junia, I want an honest translation, and the Whitall’s seem to agree on that. I am happy with that. There is no evidence whatsoever that any Greek writer at any time ever, thought that this verse was ambiguous. I could not honestly say that it would be considered an ambiguous verse in Greek. That’s my opinion but I take this from folks who have PhD’s in classical Greek. your last comment first: since you willfully ignore at least one instance (in your first comment) I can hardly take your “no Greek writer” seriously. That may be true but it is all utterly irrelevant. You talk about ancient society when this is really about language. As I said before, the piper wants to stand out among the masses by being famous to the masses. By standing out he wants to elevate, distance himself from the masses. The argument you contradicted has this exactly right. Your stubborn looking the other way doesn’t speak well for your whole argument. That’s a real big thing. /sarcasm … Still doesn’t make anyone an apostle, though. It’s not! And what traditon? That Junia was a woman? That she is a saint (albeit a very minor one)? Cross purposes! Harmonides was one of the masses. Perhaps he wanted to stand out among the masses, so as to attract a few pennies from the passing upper classes. Who knows? What does it matter. It clearly means to be prominent among the masses. The rest is ambiguous. I don’t understand the import of your other points. I don’t want to argue about women. I am no longer in that situation myself, and my remaining concern is for the health and well being of other women, and for the integrity of the text. Cheers. I don’t think that we have much further to discuss. i hope that your day goes well. You sound a little bit upset about things. Str, please don’t attack Sue personally. Yes, of course there is a serious issue about what “apostle” means in this context. But it is surely an important point that all ancient (as well as modern) Greek readers understood this verse as meaning that in some sense Junia was an apostle – even if they at some stage downgraded her to “equal to an apostle”. The interpretation that she was well known to the apostles seems to be an entirely modern one, invented by people who learned their Greek at seminary rather than at their mother’s knee. That doesn’t invalidate the new suggestion, but does suggest that it needs very strong evidence before it can be accepted as the authoritative teaching of Scripture. And Sue has shown that the evidence as presented is ambiguous and so weak. i am not aware that Junia is called “equal to an apostle.” (But perhaps I have missed this.) My understanding is that she is now called an apostle and wife of the apostle Andronicus. I realize that the Greek orthodox Church does not ordain women, but my interest is in the grammatical issues. Sue, I thought it was you who had said that Junia was called an isapostolos, “equal to the apostles”. But I see she is not listed in the Wikipedia list of such people as recognised by the Eastern Orthodox churches, although Mary Magdalene and St Nino of Georgia are among several women who are listed. Were you in fact only referring to Nino when you mentioned this title? I was refering only to Nino as equal to the apostles. 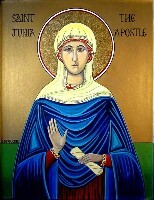 Junia is listed by the Greek Orthodox church as a saint and wife of apostle Andronicus, but perhaps not in wikipedia – that I don’t know. Nino had authority to baptize men, which was unusual and I think came from the fact that she had powerful relatives, her father and uncle had huge authority. Hilda of Whitby is another example of a wealthy woman with authority. She taught 5 bishops. Clearly women with wealth or power also had spiritual authority. I don’t think anyone has ever traced any heretical leanings back to Hilda. But I said I would not argue this point so i will leave it at that. Sue, thanks for the clarification. For that matter Queen Elizabeth I (and II, but more nominally) had huge authority over the church in her country, as its Supreme Governor, even if not accepted by the Holy See. It always amuses me to see Anglo-Catholics in the Church of England rejecting even the thought that their proposed special male bishops might be appointed by a woman they don’t accept as a bishop, when they have no problem with all diocesan bishops being appointed by the Queen. on the subject of female leadership that makes some allusions to extra-blibical sources although I cannot verify the veracity of this site. Nice one about the Anglo Catholic view on authority being delegated by a non accepted female Bishop, Peter. I had not though of that one. Since a Deanery reorganisation last year we now have 2 Resolution ABC Parishes in our Deanery (out of 14). I will try one of their deanery Synod reps out sometime, and see what the response is! Personally I have no problem with them having an enforceable right to a revamped flying bishop. But I do struggle with some of the isolation and preservation of “purity” they demand. Their response to your point might include the fact that HM the Q acts on the advise of the PM, who except for 12 years so far, has been male. Also, so far, I guess the advisroy committees have been dominated by males. Though that would be asd much the result of history as current design. Ot it might hinge on the theoretical possibility of the appointtee being rejected when the congregation us asked during the consecraton. Toungue in cheek and clutching at straws but trying to guess the possible arguments. Any strong Agnglo Catholics reading this out there who could put us right? this discussion is pointless if you insist on focusing on extralingual things just so that you can ignore the possibility that the expression might be used exclusively. Hence, I am dropping out of our “discussion”. I did not attack anyone personally. And most of the negative things I said appear just as much in her posting to which I replied. Only that this has not been shown. Where are the church fathers or other writings that make her an apostle? She is called a saint but not an apostle. Otherwise Sue would have told you, wouldn’t she? Re all these other women: to point out that Christianity has always been ripe with women holding authority and with women receiving honours of all sorts (even unusual ones) is not the same as to make even one of these women an apostle. Re Queen Elizabeth – even if we take the highly irregular entity called the CoE, to say that the Queen appoints the bishops is not telling the whole story. They don’t become bishops just because the monarch says so. There are things like elections, consecrations and, since we are talking Anglo-Catholics, apostolic succession. And even the most groveling of Queen Bess’s devotes have ever called her an apostle, or priest, or bishop or deacon or any sort of cleric – there is not a “non accepted female Bishop” involved, as the woman in question (like her predecessors male or female) never made such a claim. Colin and Str, see my new post on women bishops. The Anglo-Catholics usually focus on who makes the theoretical appointment, not on who is on the advisory committee. And they accepted the appointment of George Carey, allegedly the personal choice of Margaret Thatcher. Sue, perhaps you can outline again, for Str’s benefit, the evidence for patristic Greek writers calling Junia an apostle, or at least understanding Romans 16:7 as saying that she was one. again: even under the current irregular make-up of the CoE – which I have no intention of defending – the monarch does not delegate anything to a bishop but simply has a (historically decisive) say in the choice. And as for Sue: no need to “outline again” if that outline will be what has been said before. And no, there is no such evidence, otherwise we wouldn’t be dancing around the verse in Romans in the first place. Str, clearly you are wring in claiming that “there is no such evidence”. There is evidence if you want to read it. But if it suits your preconceptions to say “Good bye!” before reading it, that is your choice. Andrew Wilson has provided his promised answer about 1 Timothy 2:12, in a post Twelve Words, Twelve Interpretations: 1 Timothy 2:12. This starts with a useful summary of interpretations of the verse, and provides a plausible argument, although not to me a convincing one, for taking the verse as forbidding women from being elders but not from occasional preaching etc. Nonsense! There are plenty of commentaries and scholarly articles supporting at least the first two options. It’s just that people in Newfrontiers are not encouraged to read these commentaries and articles. Köstenberger’s extremely weak argument has only convinced those who already presuppose the interpretation they want to give to this verse. Kostenberger admits he has no lexical support for his hypothesis, only syntactic. However, K does not recognize that didaskein is used pejoratively in Titus, a pastoral epistle. So K does not actually address the facts. Thank you, Sue. I consider Wilson’s point about Köstenberger’s argument to be a spectacular case of only looking at evidence which supports your desired conclusion. If people from other traditions have not written many papers rejecting it, that’s probably because they consider it beneath their level. It’s a bit like claiming that the flat earth argument “has largely won the day” because no one written recent scholarly articles debunking it. Honestly, I think Kostenberger is a much more careful exegete. He admits that there is no lexical support rather than actually concocting evidence as W and B did. I think K is a better scholar in some ways. I haven’t yet looked at the K argument that is being refered to here. Perhaps later. I made 2 comments on Andrew’s post. I forgot to save the first, but here is the second. In Baldwin, evidence is introduced that does not exist. Belleville exposed this in a part of her article that is rarely refered to. However, this fact, that authentein is never used in a positive way for authority of one person over another, is foundational to all further discussion. I have never had anyone provide any other evidence to me than this. And to be completely honest here – when I consult those with a PhD in Greek as a language. almost all refrain from interpreting 1 Tim 2:12 on the basis of 1 Tim. 2:15. They claim that the grammar of 1 Tim. 2:15 is impossible to interpret, and therefore, one should not speculate on the meaning of verses which likely will never have a clear interpretation. Andrew has posted both my comments. Thanks, Andrew. this is a serious misrepresentation of my position and you do me a great disservice not to post my correction. When authentein is used of one human being over another, it is always pejoriative in pre-Constantine literature. That is a fact. Andrew and Sue, thank you for carrying on this conversation, while I have been too busy to join in. I regret any suggestion that Phil Whittall had ulterior motives for the position he expressed. However, he would be doing the right thing to avoid publicly disagreeing with the policy of the organisation within which he is serving. Phil and I will presume that biblical restrictions should be followed until we know they shouldn’t. There is a fallacy here in that you presume that you know what the “biblical restrictions” are. But you can only know what they are when you have done the research. It would be fair enough for you to write that you will presume that the restrictions currently recognised within your church grouping should be followed until you know they are not in fact biblical. But you are simply prejudging the issue by claiming that your position is “biblical”, when in fact you have no good evidence showing this. I regret engaging in this conversation. I was able to post a few comments on Andrew’s blog, but when it came to evidence, he would not post it. It is the same as what happened above. The comment is made that the evidence does not exist and then when I post evidence it is ignored or moderated out. It is not really honest. The pre-Contantine evidence that authenteo does not have a positive or neutral connotation when dealing with one human being over another is as follows. Sadly, I engaged in a dialogue in which evidence was ruled out of order. So sad. Just to clarify, Andrew has now posted my comments. I was not aware that there was a break in posting comments on the weekend. Sorry for the misunderstandng, Andrew, and thanks so much for the dialogue. Having just read all the post and comments, can I make a few things clear? Firstly, I don’t think seeing Junia as an ‘apostle’ particularly disrupts my grid of theology at all, and we’ve come to our view on roles based on our understanding of the scriptures not because someone told us to. As many within Newfrontiers would testify I don’t defer often enough and am certainly not deferring to them because they are partnering with us in mission. I happen to agree with Andrew Wilson in what he writes which is why I linked to it – I think he’s right. As to publicly disagreeing with them, I just summarised some of the commentaries that many of us have on our shelves – and despite nearly 20 years within Newfrontiers I’ve still yet to discover the ‘thought police’ that everyone thinks we have. We’re allowed to debate, we’re allowed to use blogs to discuss and disagree. I don’t see how my post puts me in conflict with a complementarian perspective, albeit not a very ‘conservative’ one. Again, hope your early days in America go well. Thanks, Phil. I have updated the link. Yes, our move has gone well, and we are now safely in Virginia and getting settled in. You know of course what an international move can be like. At least we don’t have to learn a new language! As I said before, I did not intend to suggest that you were in any way going against your conscience in this matter in order to remain in good standing with Newfrontiers. I’m certainly glad they don’t have a “thought police”. I guess you can hold whatever view you like on women being elders as long as you don’t actually appoint one. It’s the same for women as bishops in the Church of England when it comes down to it.